Well, it's Friday. For some this is the end of their work week, not for me, my weekend begins on Monday. This means that while many are going to be dragging themselves back to work, I'm going to be doing a little happy dance. Monday is the day I get my new bike shoes and pedals. That's also the day I'm going to finish touching up spots in the dining room. There are also 2 doors that need to be painted, a closet door and the door to the basement. So, my niece has had to deal with some serious drug issues, and unfortunately for her she was raised by conservatives. Translation: she's pro-gun. This AM she posted a stat on Facebook noting that there were 4,382 opioid deaths since Parkland and no one is focusing on that, rather gun control is getting all of the attention. I tried to verify that statistic and couldn't and so duly pointed this out. Of course my brother stepped into the conversation implying I meant something else, so I corrected him. I said that without proof, that statistic amounted to fake news. All I've heard since then is silence, though I'm suspecting my comment didn't go over too well. Now I'm not saying there weren't that many opioid deaths, what I'm saying is "put up or shut up." I really do get tired of Conservatives spitting out surmised facts as truth, especially when they use them as an attack. Evangelical Christians, especially white ones, use this tactic constantly. We've all heard their threatening chant "there's a war on Christianity." No there isn't. People just want equal rights. It's your prerogative not to believe in those rights, but don't claim there's a war just because round people don't fit into your square hole. Don't manufacture a statistic to justify your belief. Don't cherry pick a fact from 3 years ago and force a summation into what you believe is current. Anyway, I was going to ride the bike today but didn't. Anticipation, you know? The new shoes. 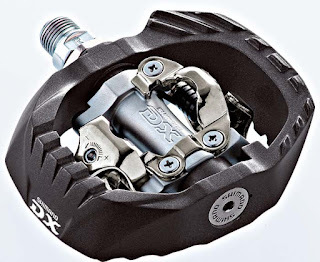 There are toe-clip pedals on the bike right now, and I can't wait to go clipless. For those who don't know pedal descriptions are a bit of a paradox. Bike shoes actually clip on to clipless pedals. 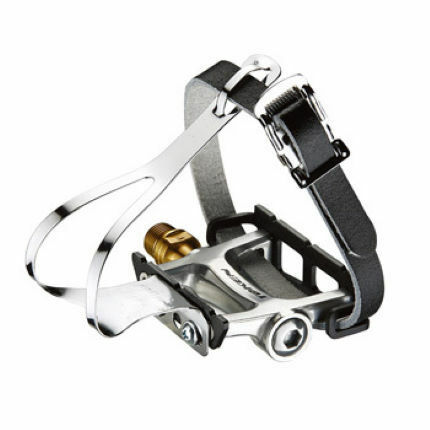 Toe-clip pedals refer to a band or small cage that wraps around your foot to keep it in place. That's right, there aren't just pedals anymore. To avoid confusion, above is a toe-clip pedal, mine are black. When you look at the difference between the two, you'd almost think a conservative was responsible for the nomenclature. Love the last line :) Just found your blog and am following you now!! dave, cranky reads bob's blog, and that's how he found my blog. I told cranky to check out all my wonderful friends. Cranky's just fine. Valley Forge pics are great. Oh, and I work this weekend..., remember my weekend is on Monday and Tuesday.